Perhaps the most effective and easy way to move information between the Samsung Galaxy Tab and your computer is to use a synchronization utility. One of the most popular is the free program doubleTwist. doubleTwist isn’t an Android app. You use it on your computer. It helps you synchronize picture, music, videos, and web page subscriptions between your computer and its media libraries and any portable device, such as the Galaxy Tab. Additionally, doubleTwist gives you the ability to search the Android Market and obtain new apps for your phone. To use doubleTwist, connect the Galaxy Tab to your computer. Use the USB cable to make the PC-Tab connection. If the doubleTwist program doesn’t start automatically after you connect the Tab, start it manually. Once connected, you will see the doubleTwist interface. To best use doubleTwist, place a check mark by the items you want to sync on the General tab. Or, you can choose a tab, such as Videos or Pictures to select specific items to synchronize. Click the Sync button to copy those files to the Galaxy Tab. Another way to use doubleTwist is to copy media items to the Galaxy Tab by selecting and then dragging their icons. Choose a media category on your computer, as shown on the left side of the doubleTwist window. Drag media from your computer to the Galaxy Tab’s icon to copy over those files. doubleTwist doesn’t synchronize contact information. 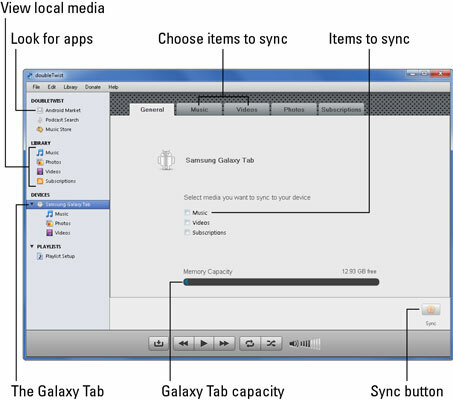 Some media organization programs on your computer, such as Windows Music Player or Windows Photo Gallery, may allow you to synchronize your media with the Galaxy Tab just as well as or perhaps better than doubleTwist.